110 FIT is a co-ed state-of-the-art fitness and personal training studio located in Leesburg, VA. We deliver functional exercise services using different modalities. Interval, metabolic and heart rate monitored are the hallmarks of our small group sessions. We offer a variety of training options and price structures for: 1-on-1 training, partner training and a small group sessions with the max of 10 participants. Increase metabolism burn for up to 48 hours. Build muscle and burn fat at the same time. 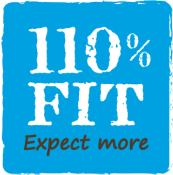 ﻿The name says it all... 110 FIT is a no judgement zone where you can expect more. Start or continue to grow your fitness journey.